A spectacular site on the south coast of England, close to the city of Portsmouth in Hampshire. On entering through the gatehouse I was struck by the vast rectangle of space enclosed by the walls, about 4 hectares (10 acres) in my estimate. The walls were built by the Romans eighteen hundred years ago – 20 feet high, 10 feet thick – and are still standing strong. In one small corner lies the medieval castle, which played a significant part in England’s wars with France in the 14th century. In the corner opposite is a romanesque church encircled by higgledy-piggledy headstones. But the Tudor connection? According to a local history (para.11), the castle was visited by Henry VIII and his queen, Anne Boleyn, in October 1535. His Grace has been in Hampshire from about the 10th September, and intends to be till 19th October, except four days that he lieth at Salisbury, and returneth to Hampshire again. He will lie at Windsor on All Hallows Eve. He was at Portsmouth and Portchester, but I was not there, for I was then commanded to cause the weirs to be plucked down upon the rivers through the whole shire. The King and Queen were very merry in Hampshire. Anne’s presence at the castle is not made explicit, but it’s a fair inference. The history also states that she and the king spent some time hawking during their visit. The royal palace is the two-storey building next to the castle-keep. The keep itself provides daunting views, whether from bottom-up or top-down – a medieval skyscraper – but its strategic significance on this stretch of coast was much reduced when Henry beefed up the defences of the city. 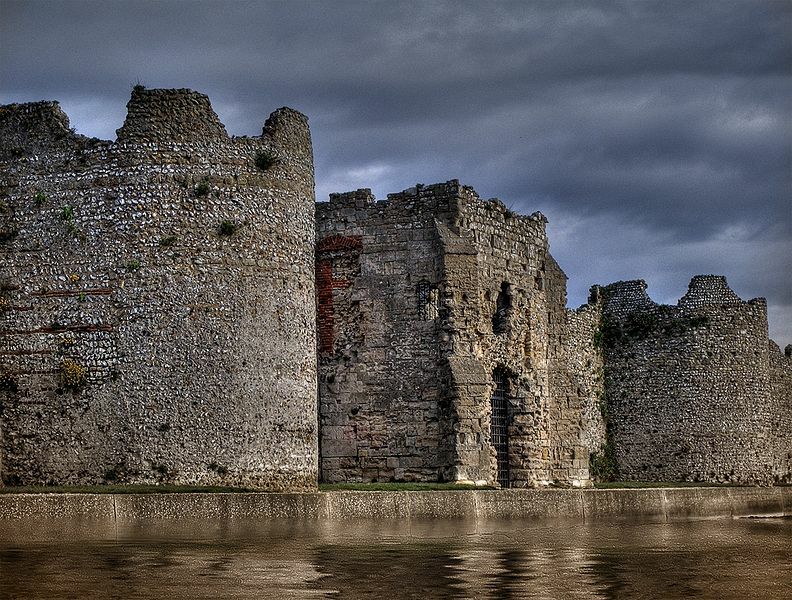 In 1601 Elizabeth I held court at Portchester (n.60). Elizabeth was Anne’s daughter, and I can imagine her being regaled by some gap-toothed crone with tales of her mother’s visit sixty years before. After that the castle was used as a prison camp and hospital. Prisoners of war had been held there during the medieval campaigns against France, but the castle’s capacity was increased enormously during the Napoleonic wars of the 18th and 19th centuries – at one point 7000 prisoners were housed in the keep, crammed in like sardines and dying like flies. The castle was only decommisioned in the last century, which explains its good preservation. Now under the care of English Heritage and well worth a visit, just a few miles outside Portsmouth. *There was a good post on the miscarriage at The Anne Boleyn Files, a few months after I posted this. It references Chapuys to pin down the estimate of 3 1/2 months.